As Manager Hedge Accounting and Treasury Control, you advise clients on treasury control and hedge accounting processes and the related treasury technology. We are seeking an experienced individual in hedge accounting and treasury control to add to our expertise and thought leadership. As our hedge accounting and treasury control expert you will be actively involved in client projects as well as developing and marketing our services to clients. You will join our established Dutch consulting team to further the growth of our corporate treasury and treasury technology practice. It is also possible to join our UK or Belgium team. We are looking for a seasoned treasury professional that has solid experience with hedge accounting and treasury control. Ideally you have worked in a consulting roles before, either acting as an internal consultant working in a corporate treasury department or as an external consultant. You are passionate about treasury and are looking to become a recognized subject matter expert within your area of expertise. We are an international specialized consultancy firm advising global organizations within treasury management, risk management and corporate finance. Our clients choose us because of our specialist and trend setting ideas surrounding financial solutions. Our 150 colleagues work from our offices in The Netherlands, Belgium, United Kingdom, United States and Switzerland. 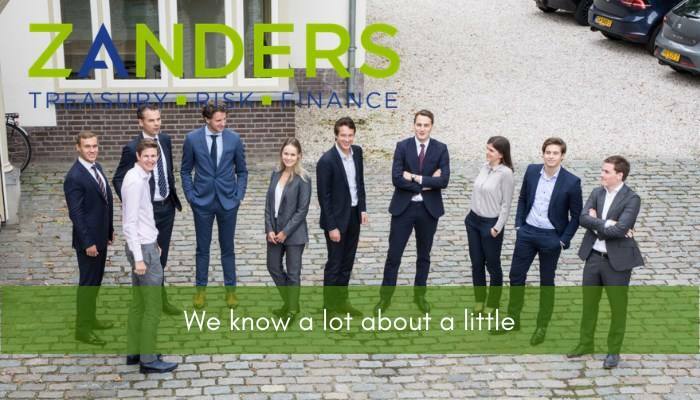 Please send your application for Manager: Hedge Accounting and Treasury Control at Zanders in Bussum including your CV via our website.